Have you room in your heart for two more industry old-timers looking to reboot the games of their yoof? Say hello to the Oliver twins, captains of Brit development mainstays Blitz Games and one-time illustrators of a somersaulting egg named Dizzy. “We’re the Oliver Twins, Philip and Andrew, and we’ve been making games since the early 80s when we were still at school,” write the Olivers on their Kickstarter page. “We’ve always believed in creating games that are fun, challenging and rewarding, and we’ve carried those principles through into everything that our company, Blitz Games Studios, has created since. Dizzy Returns will be a puzzle-platformer at its core, with enemies to avoid and hazards to traverse. The Olivers promise a game suited to both long and short play sessions, a world that drives players to explore and non-linear puzzles to be solved in any order. Returns will also see the series’ first foray into the domain of the contemporary puzzle-platformer – physics and temporality – and include a ‘Retro Mode’, featuring 8-bit graphics and an upped difficulty level. The Olivers had a couple of nice words for our fair platform, too, calling it “pretty obvious that any new Dizzy game should have a home on PC”. 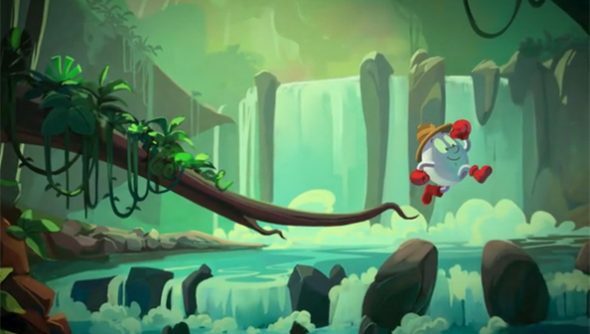 Dizzy Returns will be developed by the men and women of Blitz Games Studios, which are comprised of six UK divisions these days. They develop all sorts of family-friendly licensed games which frankly you’re not likely to recognise, so I’m going to cherry pick one that might give you hope for Dizzy’s puzzles: Droplitz. Yay Droplitz! I never played Dizzy, nor Treasure Island Dizzy, nor even Crystal Kingdom Dizzy. Alas, my face is too fresh and my manner too insolent. Did you?